Inventory We are a resale marketplace, not a box office or venue. Ticket prices may exceed face value. This site is not owned by Alliant Energy Center Coliseum . The Alliant Energy Center Coliseum is the premier indoor venue for all big concerts and sporting events in Madison, Wisconsin. 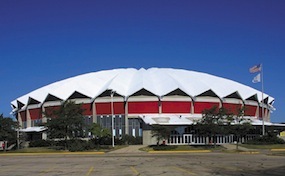 The Alliant Energy Veterans Memorial Coliseum was built in 1967 as part of the giant Alliant Energy Center multi-building complex. The venue recently received a complete restoration in 2004-2005. The Alliant Energy Center Coliseum box office is located at 1919 Alliant Energy Center Way in downtown Madison, Wisconsin. The coliseum currently has a seating capacity of 10,231. Some of the top Alliant Energy Center tickets have included events like Madison Capitols, The Circus, Elton John, Jeff Dunham, American Idols Live, and So You Think You Can Dance. Buy your tickets early becasue the Alliant Energy Center has only been gaining in poularity. ColiseumMadison.com is not in any way affiliated with any official website, box office, or venue. We are a privately owned and operated company that deals solely in all events in the secondary ticket market. Ticket prices will fluctuate with demand above and below face value. To order tickets to all Alliant Energy Center Coliseum events please pick up the phone and call our friendly staff at anytime or follow the steps online through checkout.